Good news everybody: we released a new help section. We realized that the old one had become a bit disorganized in the midst of all our development work and we decided to gather and update the best and most useful content all in one place. 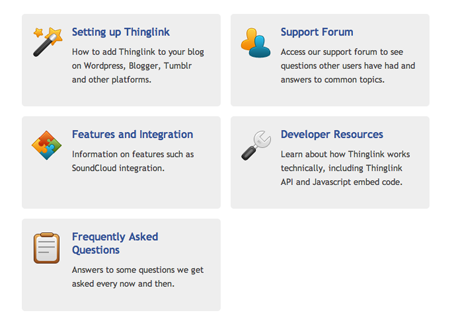 This is a continuation of our efforts to make ThingLink’s dialogue with its users sparkle. We divided the sections into five parts: “Setting up ThingLink” helps you get started and guides you through the installation process, “Support forum” puts you in contact with our team directly to ask questions or submit feedback, “Features and integration” tells you about other services that work with ThingLink, “Developer resources” features tips on how to tune the tool to your liking and “Frequently asked questions” answers all of the most interesting and thoughtful questions our users are thinking about. The new help section helps you find information on virtually all aspects of using ThingLink. Visit it now to see what we did.